Serious stuff, all discussed at today’s high-level round table in New York hosted by UN-Habitat, the UN’s coalition on affordable and sustainable housing, along with the MIT Center for Ocean Engineering, the Explorers Club, and OCEANIX, a group investing in floating cities on this new marine frontier. Bjarke Ingels of BIG—architects of the “Dryline” around lower Manhattan—unveiled his design for a prototypical floating city today, which would be made out of mass timber and bamboo. This proposal would be “flood proof, earthquake-proof, and tsunami-proof,” according to Marc Collins Chen, co-Founder and CEO of OCEANIX. 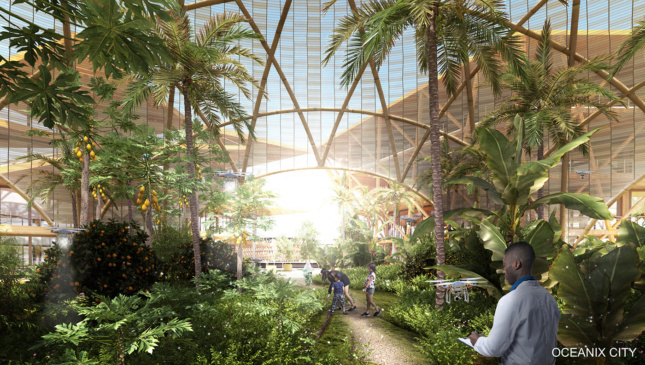 The renderings show a series of modular hexagonal islands with a productive landscape, where bamboo grown on the “islands” could be used to make glulam beams. Oceanix City, as it is called, features mid-rise housing around a shared, green public space where agriculture and recreation co-exist. Underground greenhouses are embedded in the “hull” of the floating city, while in the sky, drones would buzz by with abandon. The systems on each city would be connected, where waste, food, water, and mobility are connected. Because the cities are towable, they can be moved in the event of a weather event. Land reclamation (creating new land by pouring sand in the ocean) is no longer seen as sustainable, as it uses precious sand resources and causes coastal areas to lose protective wetlands and mangroves. Could floating cities be the way forward for expanding our cities as we deal with the consequences of climate change and sea-level rise? According to the coalition, “Sustainable Floating Cities offer a clean slate to rethink how we build, live, work, and play…They are about building a thriving community of people who care about the planet and every life form on it.” Doesn’t this sound a lot like the Seasteading Institute, the infamous group of libertarian utopianists who want to break away from land and society altogether? For Collins, his floating infrastructure is less ideological, and more about infrastructure technology. These floating cities would be positioned near protected coastal areas, less ocean-faring pirate states and more extensions of areas threatened by rising sea levels. “These cities have to be accessible to everyone. We can’t build broad support for this without populist thinking,” said Richard Wiese, the president of the Explorers Club. The first prototypes will start small, even though they are thinking big. The 4.5-acre pods will house 300 people, while the goal is to scale the system by repeating the unit until the city can hold 10,000 people. Can floating cities be more sustainable and affordable than building on land? Would they only be for the rich? Would they be self-sufficient? Would they prevent climate gentrification and curb climate migration? Or, as has been the case in the past, will the idea prove too expensive to actually build?